Norwegian patient diagnosed with Borrelia Miyamotoi. Borrelia miyamotoi is a species of spiral-shaped bacteria that is closely related to the bacteria that cause tick-borne relapsing fever (TBRF). It is more distantly related to the bacteria that cause Lyme disease, Borrelia Burgdorferi. Symptoms include include fever (usually relapsing), headache, muscle pain, fatigue and possibly encephalitis and can be very dangerous for immunodeficient people. It was first identified in 1995 in ticks from Japan, Borrelia Miyamotoi has since been detected in two species of North American ticks, the black-legged or “deer” tick (Ixodes scapularis) and the western black-legged tick (Ixodes pacificus). These ticks are already known to transmit several diseases, including Lyme disease, anaplasmosis, and babesiosis. Borrelia Miyamotoi has also been dicovered in ticks in several European countries, including Norway, Sweden and Denmark. Borrelia Miyamotoi was first identified in ticks in Norway in 2015 . See published study from Science Direct. So far there has been no reported human cases in Norway until now. Currently there are no commercially available tests for Borrelia Miyamotoi, and regular Lyme tests cannot be used. The most accurate way to diagnose is to use DNA testing. 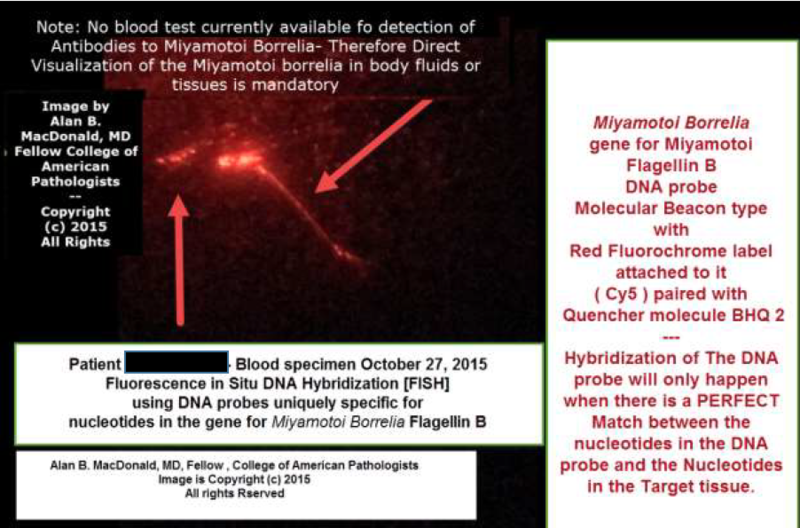 The Norwegian patient in question had blood tested using FISH analysis by Dr. Alan MacDonald. 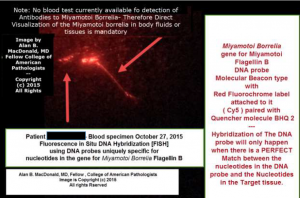 The blood tests show presence of Borrelia Burgdorferi and Borrelia Miyamotoi. See full report below. Picture in courtesy of Dr. Alan MacDonald, copyright 2016.